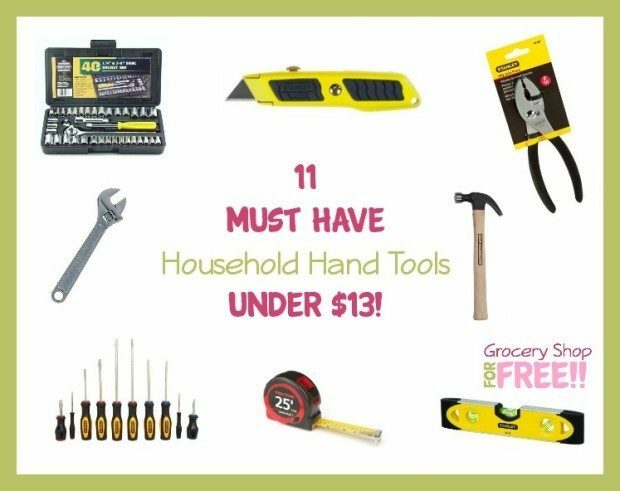 11 Must Have Household Hand Tools Under $13! You are here: Home / Great Deals / Amazon Deals / 11 Must Have Household Hand Tools Under $13! There are certain hand tools you need just to go through life as a regular person. Not because you are a DIYer or a crafter, but just because there is always stuff to deal with. Take a look at this list of 11 Must Have Household Hand Tools Under $13! 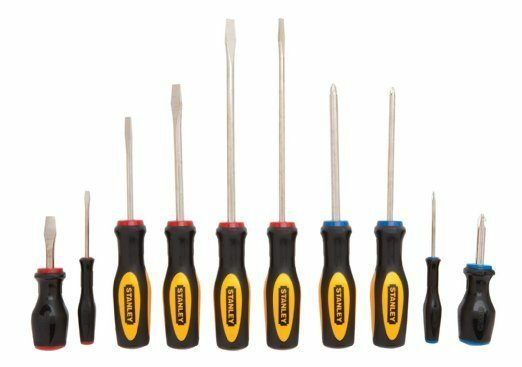 Stanley 60-100 10-Piece Standard Fluted Screwdriver Set – Whatever you are trying to fix, you most likely need a screwdriver. Please don’t use your butter knives, it just ruins the knives and doesn’t really work. This set has a range of both flat head and philips head screwdrivers that will pretty much cover all your fix ups! Stanley 16 Ounce Hickory Handle Nailing Hammer – A 16 ounce hammer works pretty well for both guys and gals and has enough heft behind it to hang any picture you need. 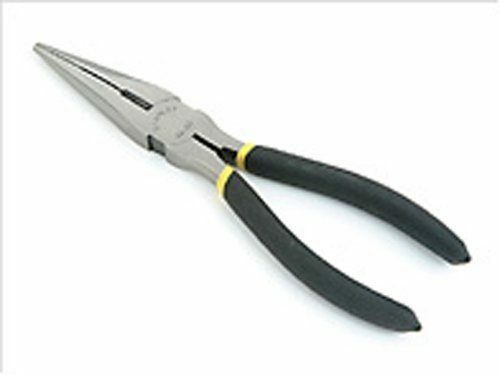 Stanley 84-097 6-Inch Slip Joint Plier – When you need to hold onto something to fix it, slip joint pliers are what you need. Just latch on and squeeze tight! Stanley 10-779 Dynagrip Retractable Utility Knife – Put back the steak knife! A simple boxcutter (utility knife) works so much better! I like this one that is grippy. The blade retracts for safety. 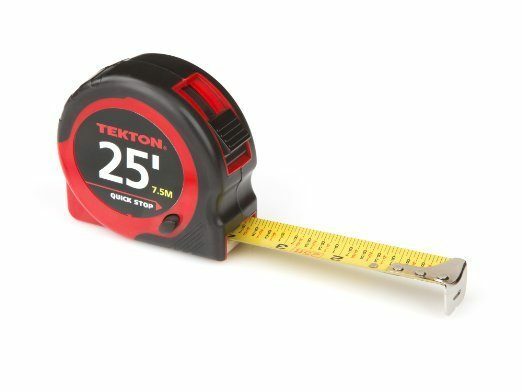 TEKTON 25-Foot by 1-Inch Tape Measure – A ruler or yard stick will only take you so far in life. Need to know if that new couch will fit through the front door? You need a tape measure. Stanley 87-471 10-Inch Adjustable Wrench – That thing you are fixing is slipping through the pliers, next step up is an adjustable wrench! It locks into the width you need and you can use all your strength just to hold it in place. Stanley 8-Inch Long Nose Plier – Need to use pliers but the space is to small? Dropped a screw down a hole? Long nose pliers to the rescue! 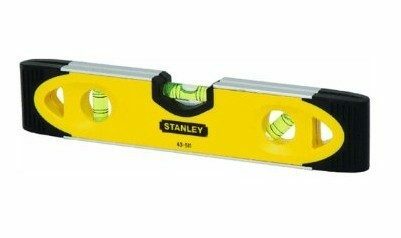 Stanley Magnetic Shock Resistant Torpedo Level – You need a level if you want to hang shelves, curtain rods or multiple pictures and you want them to be straight! 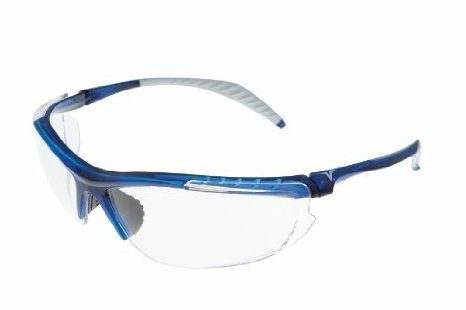 Encon Wraparound Safety Glasses – Even if you wear glasses you still need safety glasses. Protect your eyes from flying debris! Stanley 6-1/16-Inch Wood Handle Scratch Awl – You need to put a screw into a piece of wood but you can’t get it started. Use an awl to create a starter hole! 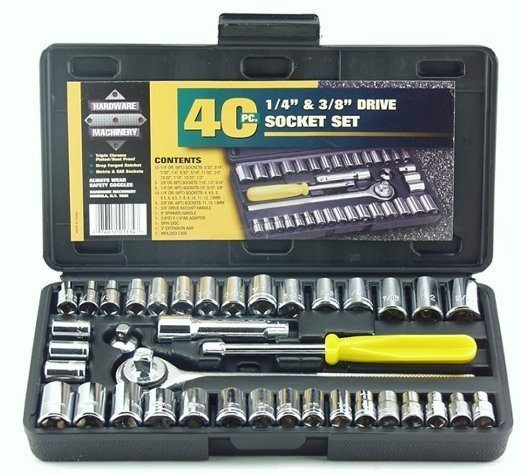 Great Neck 40 Piece 1/4-Inch and 3/8-Inch Drive Socket Set – This is a nice to have. When you need to tighten or loosen a bolt a socket and handle will provide the most leverage! Let us know what you would put in a starter tool box! Did we miss anything?